11.Paul Revere & The Raiders – Here They Come! Having seen these guys every day after school on the show Where The Action Is and having already bought their newest LP Just Like Us!, this album jumped out of the rack at Broomfield’s drugs. The hair was alot shorter and the guy playing bass didn’t seem to be Fang, but what the heck the back cover talked about the tv show and had a jokey band history so it had to be good. Later I figured out this was a new issue of an older album with newer liner notes that didn’t mention bassist “Doc” Holliday. Side 2 was a bit tame, but holy cow – side 1 rocked like a mother in a pseudo-live setting. To this day, it’s hard to top the instrumental blast of opener “You Can’t Sit Down” or Lindsay’s scream on “Oo Poo Pah Doh”. 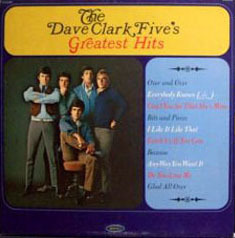 Getting this many hits in one place plus a cover that folded open was a real deal back in early 1966 (the LP came out late in 65 but who had the cash?). “Mrs. Brown, You’ve Got A Lovely Daughter” or the guilty pleasure of “I’m Henry, VIII I Am” but my fave was “Just A Little Bit Better” which still reminds me of Buddy Holly with Peter Noone’s a-ho-ho hiccups. My fave group at the time (and you had to certainly pick a fave so you could argue with your pals who was better – The Beatles, the DC5 whatever – pretty silly) and finally all the hits in one place. “Glad All Over” “Bits & Pieces” and even the ballad “Because” was at least tolerable as a respite from the rock mayhem. Good looking cover too. Epic records came in a plastic bag you had to “unzip” to get the record out which was different than the other paper inner sleeves, by the way. It took awhile, but the world’s biggest group finally hooked me with the rocker “Day Tripper” and “Act Naturally”. The album was a Capitol records creation but it was a good one – “Drive My Car” “Nowhere Man” and even “Yesterday”. Brought it home and had an “discussion” with my dad about buying a record by a bunch of “drug users”. Well, the drug part never infected me, but Beatlemania sure did. Years later I read about the banned cover under the outer picture so I tried to steam mine and managed to really mess it up royally – wish I could go back in time and stop myself. Ah, but it was back to old stand-bys the DC5 for an album that is still one of my all-time faves even though the hit wasn’t huge and the length could barely hit 20 minutes. Great “wall of echo” songs like “I Never Will” and “Looking In”. For once buying the mono version worked as years later I heard the abomination that was the reprocessed stereo – ugh. 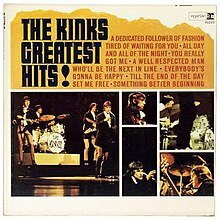 16.The Kinks – Greatest Hits! Another British Invasion band with a hits package and it mostly smoked. “You Really Got Me” “All Day & All Of The Night” “Till The End Of The Day” are just a few of Ray Davies’ classics. The Kinks are for sure the most underrated of all the great bands from that era. Plus the package again looked great (nifty flying V guitar, Dave) down to the Reprise riverboat logo. Once again, buying the mono LP and saving a buck worked out as the original trax weren’t in stereo. During fall break, sis and I were farmed out the grandparents house in Ft. Collins and thankfully grandmom offered to buy me 2 albums. This is the first one and frankly you didn’t need any more than nasty title track with Jeff Beck’s otherworldly guitar. Epic records sounded good – loud with alot of punch. Crisp treble and bone-rattling bass on most songs. Some were pretty weird (“Hot House Of Omagarshid”?) but “Lost Woman” and “Turn Into Earth” were good plus the simple haunting piano track “Farewell” was one of the first ballads I liked. The second album thanks to grandmom (we miss you!) had two hits (the title track with memorable calliope organ plus “Turn-Down Day”) on it though the band looked suspiciously clean-cut. At least they were named by John Lennon and had the luck of Paul Simon to give them great pop songs like the title track and the gentle “Cloudy”. “Big, Little Woman” and “How Can I Leave Her” were actually pretty good album filler. Oh my, the tv show, the album featuring “Last Train To Clarksville” and the group sure hit me and my generation like a ton of bricks. They were funny, looked great and had fantastic songs. Other than perhaps “Gonna Buy Me A Dog” which was at least goofy, the album was great pop from end to end. And thanks Mike Nesmith for my first exposure to something resembling country music in “Papa Gene’s Blues” and “Sweet Young Thing”. Hey, R & R Hall Of Fame – why no induction? Yet another hits album as this was the best way to maximize your return on investment. Again, a nice folding album cover and all the goodies from “This Diamond Ring” to “Green Grass” and thanks to Snuff Garrett they sounded great. Or maybe they didn’t – one of the only albums I bought in stereo at the time which was a huge mistake as the mix was horrendous with all the vocals in one speaker and all the instruments in the other which sounded terrible.